Snakes are probably the most feared animals in the world, and there’s no judgment in that because snakes are pretty scary. A hissing sound in the woods could be the end of you, you’d think. Ultimately, you’d give in to panic as it slithers in front of you. We wouldn’t fear snakes that much if they did not have predatory qualities. Some bind people to death with their bodies while some spew deadly venom – enough to kill a group of people. Around 25% of the snakes’ total population is classified as venomous. So now, we are bringing you a list of the 10 most venomous snakes in the world. 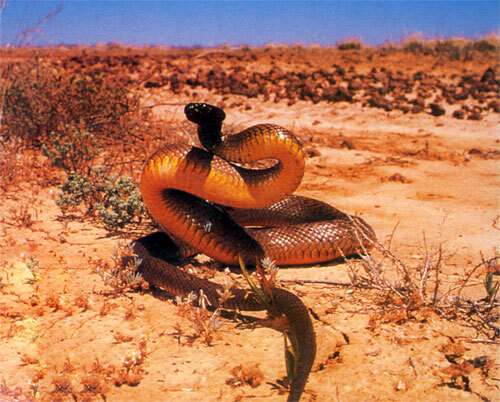 Tiger snakes are native to Australia and Tasmania, and spew serious neurotoxic venom. A person bitten by a Tiger snake may die within 30 minutes, but if treated immediately, the average time expands to 6-24 hours. Tiger snakes are only aggressive when they feel a direct threat such as being cornered, but if encountered without attacking them, they just slither away. The Acanthophis, also known as the Death Adder, is common in New Guinea, Australia and other countries in that region. 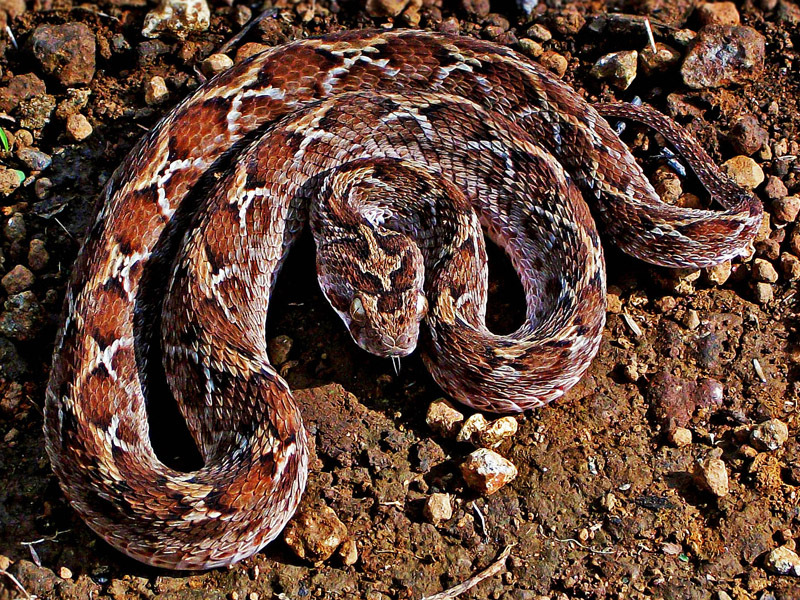 The word “Acanthophis” has Ancient Greek roots and translates to “spine” in English. Death Adders are known for the spine in their tail. They have a short yet robust build and scaly heads which seem to be shaped like triangles. With a single bite, they can shoot around 40-100 mg of highly poisonous venom. Common in almost all parts of the world, the Saw Scaled Viper is the most dangerous type of viper. Their diet consists of insects, birds, small mammals and even fellow snakes. So yeah, there is such a thing as snake cannibalism! They are known to produce a warm sizzling sound, resembling that of a hot plate when sprinkled with water. This occurrence is called “stridulation”. This species of Cobra spew the deadliest venom out of all the Cobra species. They can spit their venom for up to 3 meters and if you think that’s crazy, you should also know that their venom can cause paralysis and even death within 30 minutes. As soon as they detect a threat, a hood immediately appears. Sometimes, large rats can fatally injure the Philippine cobra. These rats attack by biting and scratching. Rattlesnakes are one of the most common species of snakes in North and South America. In fact, it is reported that a huge number of snakebite injuries are caused by these snakes. Rattlesnakes are distinguished by the rattle-like part at the end of their tails. The venom they spew causes degeneration of organs, severe blood clotting, difficulty in breathing, and even paralysis. It is known that juvenile snakes are more dangerous than the adult ones because they have less control over their venom. The Black Mamba takes its name from the charcoal black color of its mouth’s interior. It is commonly found in Africa. It is the longest and one of the fastest moving species of venomous snake in the whole world. The Black Mamba’s venom can cause a victim to collapse within a maximum time of 45 minutes. Unless cornered, it usually just moves away from humans when encountered. Taipan snakes belong to the elapid family of the genus, Oxyuranus. They are known to be fast, large and greatly venomous. Because of these qualities, they are considered to be some of the deadliest snakes known to man. They are common in Australasia and their diet consists of rats and other small mammals. The effects of its deadly venom include severe blood clotting and paralysis of the person’s nervous system. The victim may die within an hour if not treated immediately. The Malayan, also referred to as the Blue Krait, is to date the most lethal out of its species. 50% of Blue Krait snake bites are critical even with antivenin treatment. They can hunt more efficiently in the dark. Although these creatures can fatally injure their prey or victim, they usually just slither away from a fight. Just a tiny amount of venom is enough to put the Eastern Brown Snake’s victim to death. Even the small ones can aggressively strike and kill a grown man. They are very aggressive creatures, known to chase their attackers and strike them repeatedly. If you happen to encounter an Eastern Brown snake, it is best for you to stand very still as they can only sense through movement. The Belcher’s Sea Snake is the most venomous snake in the whole world. Just a few milligrams of its venom are enough to put 1000 people to death. Their victims are mainly fishermen. These atrocious creatures are found in the waters of Southeast Asia and Northern Australia. This daring woman and a husband travelled to South Pacific to discover the most dangerous animals in the world. She definitely took a lot of risk to have this incredible moment captured with a snake that is 10 times more venomous than the rattlesnake!